Set in the southwest corner of Diyar Al Muharraq on a 6,000 sq-m area next to Dragon City, ThaiMart is a first-of-its-kind shopping centre which will offer both local consumers and tourists products that are exclusively imported directly from Thailand. The project design is infused with Thai architectural and cultural aspects, in a layout which will incorporate approximately 150 individual retail store spaces, with a spacious car parking lot for customers’ vehicles. 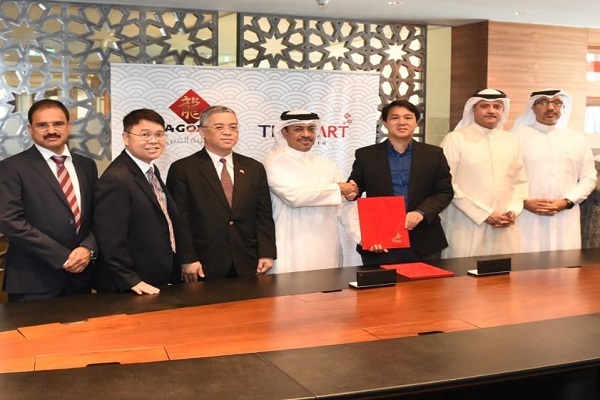 With the soft opening of the Mart expected to take place in the first half of 2019, it is set to revolutionize the oriental goods industry in the Kingdom of Bahrain with the vast array of retail opportunities it will provide, said Dr Maher Al Shaer, the managing director of Dragon City, after signing the deal with Akavut Tangsilikusonwong, the managing director of Vega Intertrade and Exhibitions, at the Diyar Al Muharraq Headquarters at the Bahrain World Trade Centre. The signing ceremony was held under the patronage of Thanis Na Songkhla, the Ambassador of the Kingdom of Thailand to Bahrain, in the presence of members of the executive management of Dragon City. Dr Al Shaer said: "It brings me immense honor to thank His Royal Highness Prime Minister Prince Khalifa bin Salman Al Khalifa for issuing an edict entitling holders of Thai passports to engage in retail commercial activities with 100 per cent ownership rights." "At this juncture, I would also like to announce the agreement we have come to with Vega Intertrade and Exhibitions for the complete operations of what is set to be one of the flagship projects within our city, ThaiMart," he stated. "With ThaiMart expected to further enhance the landscape of the retail industry in Bahrain with the unique offerings that it provides, the project will also significantly fulfill and augment the role that the city holds as a vital player in the economy of the Kingdom," he added. Dr Al Shaer pointed out that the concept of a Thai-themed shopping centre also serves to strengthen bilateral relations between Bahrain and Thailand, and the success it is envisioned to reap will reiterate the importance of supporting and enhancing the development of economic and investment cooperation between the two friendly countries. "Therefore, we look forward to working with Vega Intertrade and Exhibitions for the manifestation of this promising development,” he added. ThaiMart will offer a variety of Thai products such as food items, beauty products, garments, perfumes, handcrafts, home decorations and leather goods made available for purchase to the people of the Kingdom of Bahrain, thereby setting it up to draw in a multitude of visitors on a regular basis.